Young Hawaiian Farmers Learn Leadership And Gardening Skills : The Salt The program practices tough love — Hawaiians call it kuleana, or a sense of personal responsibility. Kids commit to more than two years of work, and get free college tuition for their "sweat equity." Cheryse Sana, left, and Derrik Parker were interns 10 years ago and now help manage the farm's current interns as well as run the day-to-day operations. A tight circle of teenagers is deep in conversation — not about movies or apps, but about ... vegetables. It's 7 a.m. at MA'O Organic Farms, part of 24 acres nestled in an emerald mountain-ringed valley just two miles from Oahu's west shore. Under a hot sun that bathes this idyllic breadbasket, college-aged farmers harvest tons of mangoes, bananas, mizuna (mustard greens) and taro every month for the island of Oahu. The farm's atmosphere bubbles with enthusiastic lightheartedness, its college interns quipping across the rows that they can beat their neighbors' harvesting speed. But a calm falls over the group as they move from joking around to talking more seriously. A circle forms under an open pavilion, and a young woman speaks. "We got 21 more orders for parsley because our stuff is great," Junell Fonokalafi, a student intern from Leeward Community College, says proudly. The organic bunches of parsley will go to top Honolulu restaurants like Chef Ed Kenney's Mahina and Suns, and also direct to consumers at markets like Whole Foods and Foodland Farms, where few might know that teenagers are growing their organic produce. "No panic, organic," everyone chants in approval after each speaker, clapping twice. 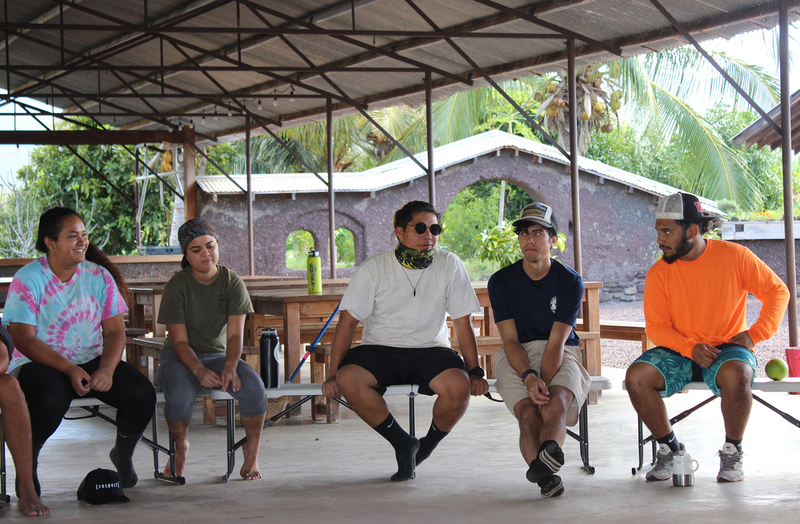 "You guys only took an hour to harvest and had three hours to catch up with weeds and complete the order," Scott Kaeo, a farm intern from Leeward Community College, congratulates the group. "But last week, there was a bunch of food and stuff on the floor after lunch. Y'all are eating and missing your mouth." Everyone laughs, but it's noted: You had better clean up after yourself, because no one is just a carefree kid at MA'O. MA'O interns gather in the morning circle to discuss farm progress, chores, FAFSA applications and school requirements for registration. A successful indie farm is a high bar, but MA'O's mission is harder. Meaning mala (garden) ʻai (food) ʻopio (youth), or youth food garden, MA'O seeks to grow leaders heartier than its legendary staple of ulu, or breadfruit. Waianae's residents are mostly native Hawaiians, and the area ranks among the poorest communities in the state of Hawaii, with a median household income of $58,807 and 25.9 percent of its population living in poverty. Some 9.5 percent of residents are unemployed and only 9.2 percent possess a college degree. MA'O founder Kukui Maunakea-Forth, a native Hawaiian who grew up on the knee of her homeland-dwelling grandmother, wanted to create a system where Waianae's youth could learn cooperation, accountability and empowerment, while receiving free college tuition for what MA'O's leaders call their "sweat equity." 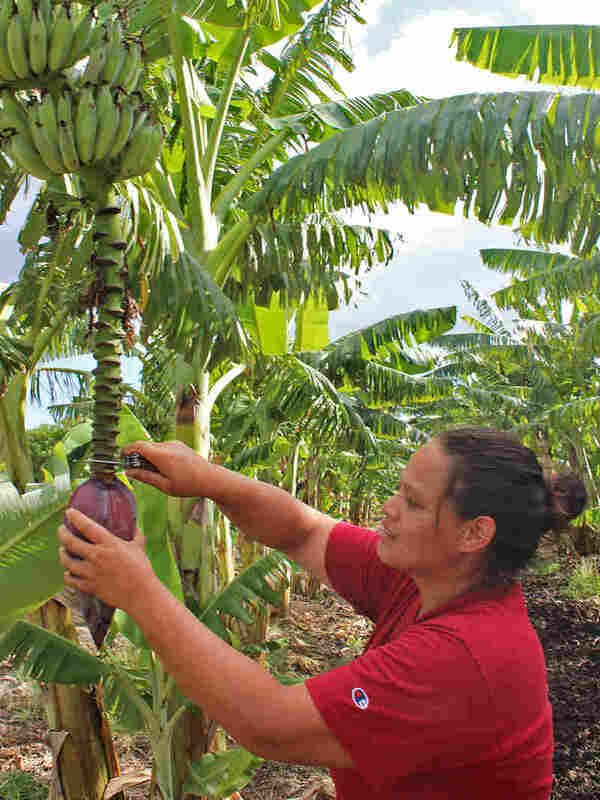 In 2001, she and her husband, Gary Maunakea-Forth, signed a 25-year lease for five acres in the Lualualei Valley and set up a successful farm and training program. MA'O's other 19 acres are owned by a non-profit called Wai'anae Community Re-development Corp. The 30 interns, who come from Leeward Community College and the University of Hawaii West Oahu, commit to what seems like an eternity for a teenager: two and a half years of work. Their 20 hours a week are divided among shifts on Mondays, Wednesdays and Fridays from 7 a.m. to noon, with some Saturday farmers markets to learn sales and customer service. In return, MA'O pays up to $3,200 per year for their tuition plus a starting stipend of $500. By the fourth semester, the best-performing interns receive a $600 stipend. The key to MA'O is its structure of tough love — Hawaiians call it kuleana, or a sense of personal responsibility. Students must maintain a 2.0 grade point average at school, and every semester, each intern receives a full evaluation aggregating her or his school GPA and farming GPA — an idea the Maunakea-Forths got from reading about Whole Foods' aggregate employee evaluation system. The results determine each intern's pay scale, teaching them that actions have real consequences. 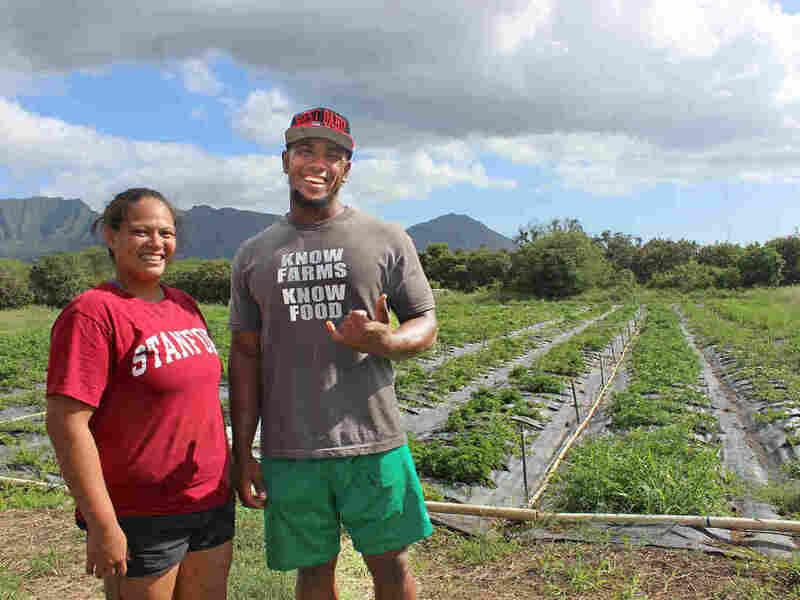 Kamuela Enos, MA'O's director of social enterprise, says the system was designed so that Wai'anae's young farmers of color won't be left behind and can take leadership positions. "There are predatory forces out there for brown underemployed people," Enos says. "Getting a college degree isn't a silver bullet, but it's part of an empowerment piece. Otherwise, someone's going to be your boss who has a college degree, and you're going to be their wage slave." Cheryse Sana, farm co-manager, cuts a banana blossom off a tree at MA'O Organic Farms. That's why, Enos says, so much time at MA'O is spent emphasizing self-sufficiency and leadership. From learning how to navigate the bureaucracy of FAFSA forms and school registration to how to inspire a harvest group to work more cooperatively and efficiently, MA'O isn't just about the sweet Pirie mangoes it produces, but also about the purposeful young global citizens it harvests. "They're not kids anymore — they're young adults," farm manager Cheryse Sana says. Together with farm co-manager Derrik Parker, they oversee the day-to-day operations of the interns. "The idea behind the tough love is that we're really trying to get them to understand the importance of kuleana, just understanding finding purpose in life is finding who you really are, whether it's a family or a job that you commit to," Parker says. "We help them understand this is your life, this is your community." Parker relates an anecdote to illustrate this mindset: "There's a saying that a kid had broken something or left it dirty in the house, and said to his papa, 'I'm so sorry for leaving your house dirty.' His papa said, 'You didn't make my house dirty, you made your house dirty.' We're trying to push that same method into them. It's not just about MA'O, but you guys are MA'O. You're the leadership." Sana says part of what brings the young farmers to adulthood is MA'O's 10-week summer training program called Ramp-Up, when they take an emotional intelligence class. "Talking to young men, especially who've never had that kind of conversation, is really uncomfortable, but they learn that instead of just reacting, they can calm down, breathe, and think or find help before they respond," Sana says. "That training is really not there for some of these kids, who've never had that kind of support." One of MA'O's Ramp-Up successes is Dez Munar, an intern whose decision to transfer to University of Hawaii West Oahu to pursue a degree in Sustainable Community Food Systems, was influenced by his work at MA'O. Munar says that until recently he thought he wanted to be a Makaha Valley police sergeant like his father. Though Munar and his father farm a half-acre at home, he had never considered farming as a potential career choice. But when a MA'O counselor came to Leeward Community College and told him they could help pay his $1,190 tuition, Munar jumped at the chance. He soon found he loved the problem-solving opportunities at MA'O, such as when Gary Maunakea-Forth put Munar in charge of planting and irrigating an entire kale field. Munar was able to cut planting times down by an hour by using branches to dig and drop seeds while standing. "I'd rather work smart than hard," Munar says. Munar likens his experience at MA'O to that of the plants that he grows. "One of the problems of this community is we don't know what to do, we don't have [a] plan, but MA'O is potting us, fertilizing us like a plant, until we can pop out. My harvest would be graduating." Dakota Kim is a food, TV and culture writer living in Southern California. Tweet her @dakotakim1.